CC-4-2-20-12-12-SS 12' 20" 12" Single Sided 13,200 lbs. CC-4-2-20-12-12-DS 12' 20" 12" Double Sided 13,200 lbs. CC-4-2-20-15-12-SS 12' 20" 15" Single Sided 13,200 lbs. CC-4-2-20-15-12-DS 12' 20" 15" Double Sided 13,200 lbs. CC-4-2-24-12-20-SS 20' 24" 12" Single Sided 11,200 lbs. CC-4-2-24-12-20-DS 20' 24" 12" Double Sided 11,200 lbs. CC-4-2-24-15-20-SS 20' 24" 15" Single Sided 11,200 lbs. CC-4-2-24-15-20-DS 20' 24" 15" Double Sided 11,200 lbs. CC-4-3-36-12-4O-SS 40' 36" 12" Single Sided 14,400 lbs. CC-4-3-36-12-4O-DS 40' 36" 12" Double Sided 14,400 lbs. CC-4-3-36-15-4O-SS 40' 36" 15" Single Sided 14,400 lbs. CC-4-3-36-15-4O-DS 40' 36" 15" Double Sided 14,400 lbs. 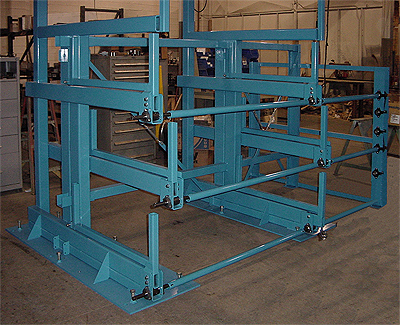 Cantilever rack is great for storing bar stock, tubing, pipe, conduit and other long and heavy items, but accessing those goods can be a real pain in the back, neck, and arms - as well as dangerous. Imagine trying to hoist a load of bar stock out of a traditional cantilever rack - good luck! With crank-out arm levels that extend to 100% of the arm length, you can easily reach the stock goods with a hoist or other overhead lifting equipment. 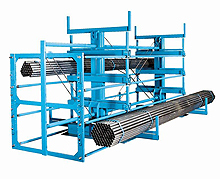 No more reaching, twisting and struggling to move heavy stock. Just crank-out the level you want and easily reach the goods you need. The rack even has a locking mechanism that prevents over balancing the rack by preventing more than one level being cranked out at a time. You should also consider how much flex your stock goods have when supported over 2 or 3 arms. You will want to have enough uprights and arms to prevent deformation while in storage.